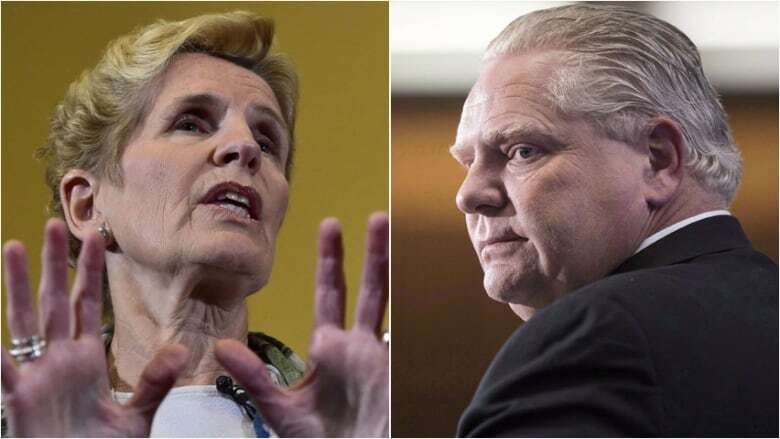 Ontario Premier Kathleen Wynne is defending her comparison of Ontario Progressive Conservative Leader Doug Ford to U.S. President Donald Trump this week, saying she doesn't think her remarks will undermine the province's trade relationship with the U.S. in any way. 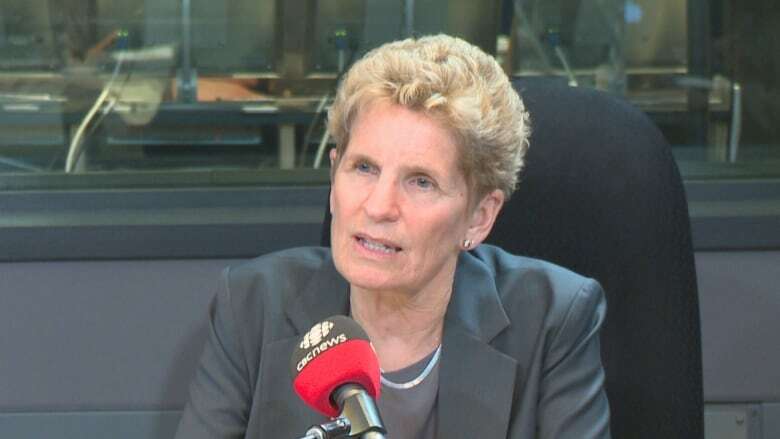 Ontario premier says comments won't undermine province's trade relations with the U.S.
"I've been very, very careful," Wynne told CBC's Metro Morning on Thursday. "I don't know what Donald Trump's reaction would or wouldn't be. He may be fine with being compared with Doug Ford. That's up to him and it's up to Doug Ford. But what I have to do is I have to recognize behaviours for what they are, and name them." Wynne first compared Ford to Trump in remarks to a Toronto audience on Wednesday. "Doug Ford sounds like Donald Trump and that's because he is like Donald Trump. He believes in ugly, vicious, a brand of politics that traffics in smears and lies. He will say anything about anyone at any time. Because just like Trump, it is all about him." Wynne told Metro Morning her comments were in response to a news release issued by Ford on Tuesday in which he suggested the premier would be in jail if she weren't in politics. 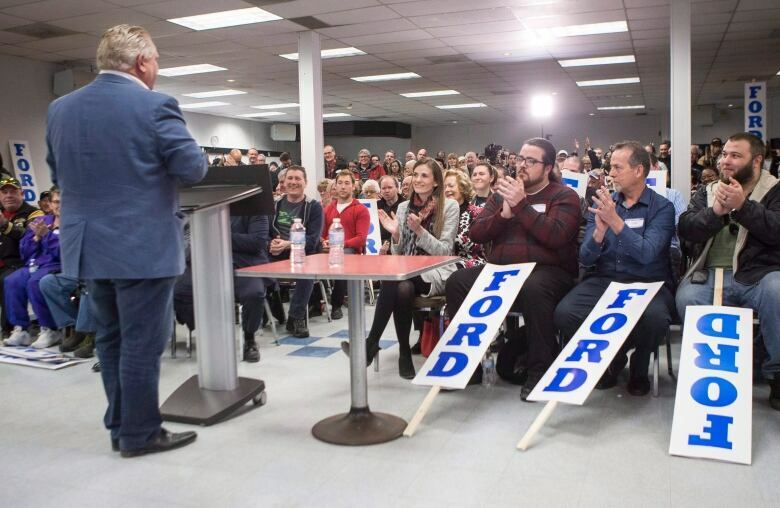 Ford said: "If Kathleen Wynne tried to pull these kinds of shady tricks in private life, then there would be a few more Liberals joining David Livingston in jail." Livingston is a former Liberal aide who was recently sentenced to four months in jail for his role in the gas plants scandal when Dalton McGuinty was premier. Asked who she is trying to appeal to with her comparison, Wynne said: "I am trying to state the truth about a situation. That will appeal to whomever sees the situation the way I do. I think it's important, even if it doesn't appeal to a lot of people. "I believe that it is my responsibility to be honest about what I'm experiencing and what I think is in the best interests of the province. I don't think it's healthy for this province to have a campaign and to let a campaign roll out in a way that allows that kind of behaviour to just hang out there without being challenged." Wynne said Ford's comments were an attack on her integrity. "I have to call it out. I want to have a debate about issues and things that we can do in this province to make people's lives better," she said. "The implication was that I should be in jail. It's very reminiscent of the 'lock her up' kind of language. I just think that it's important, that when there's that kind of behaviour, that it be called out." Wynne said her concern is that it will be difficult for the leaders to focus on major issues during the official election campaign now that the tone, three weeks before the campaign is expected to begin, is already vicious. "It's going to be hard to pull the debate back to the things that are really important." She said when she was growing up, her sense of political decorum came from "really decent" political leaders, such as former Ontario premiers John Robarts and Bill Davis and former Canadian prime ministers John Diefenbaker and Lester Pearson. She said it's important that young people learn that the current discourse in Ontario is "not okay." When asked by CBC host Matt Galloway whether she has lost her cool, Wynne said: "I'm responding to an unusual candidate." At the news conference, Wynne reminded voters that the Liberals want the province to be competitive and she has met with 38 U.S governors. "I have travelled to the United States. I've stood up for Ontario workers," she said. "There is no doubt in anyone's mind in the United States that Ontario is open for business, that we want an open trading relationship."